EDIT: With computer problems like this, if you don't have any spare parts to test then your only real option is to replace stuff one by one. Since you already have a pretty solid inclination that it is the RAM, just replace that and see what happens. Although, before you replace your RAM, can you list your PC specs? I just thought of something. 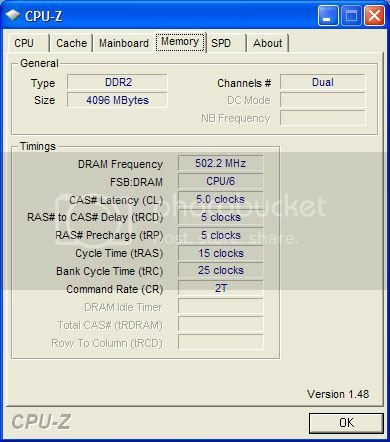 Some RAM requires higher than stock voltages, and most motherboards default to 1.8V or something for RAM. If you have some high performance stuff that requires like 2.0-2.1V, then it will be very unstable at 1.8V. So, post up your specs. I put it to 1.9 bc a friend of mine told me that was good enough? you should run it at the stock voltages, also check the timings make sure they are with in spec. If the RAM is rated for 2.2V, put it at 2.2V. It may seem like a lot, but if that's what the RAM requires then it is only normal. Undervolting will cause instability. And yes, like philbar said make sure the timings are correct as well. also what do you mean by timings? The default timings for that RAM is 5-5-5-18 and the default voltage is 2.1V. So, in your BIOS, find the memory configuration menu and change the voltage to 2.1V and make sure the timings are 5-5-5-18. Usually auto should work. You can check once you're in Windows to see what your timings are with CPUz. Download this, run it, and click the memory tab. Ok downloaded and clicked the link. What am i looking for? Yours should look something like this, except Cycle Time (tRAS) should be 18. Post a screenshot of the memory tab if you're unsure.